Below is a list of Frequently Asked Questions (FAQ). How to get from the airport to Oeiras? By public transportation, the easiest way is to take the subway to Cais do Sodré. You have to change from the red to the green line at Alameda. From Cais do Sodré take the train to Oeiras. This should cost you 3.30 € and take ~1 h.
Uber or taxis will take ~30 min. and cost you ~20/25 € or ~40/45 €, respectively (without traffic). Any recommendations for nearby accommodation? The The Instituto Gulbenkian de Ciência (IGC) is located in Oeiras, a village by the sea 20 km away from Lisbon. Last time we checked their website, no rooms were available. However, we contacted them and they still had some rooms. So if you want to try this option, please email them at the address above. (search by IGC address: Rua da Quinta Grande, 6, Oeiras). What are the durations/formats for talks and posters? 15 min. talk, followed by 5 min. discussion. Please make sure you keep to your time. We recommend that you save your presentation using a 4:3 ratio format (e.g. 1024 px × 786 px). Preferential file formats are .ppt, .pptx or .pdf. Both a Mac and a Windows computer will be available. You will be provided with a dropbox link to a folder for uploading your presentation (uploaded files will be visible only to the organizers). Please upload your file before 8.00 or 13.00, depending on whether you are presenting in the morning or afternoon sessions. Please name your files: LASTNAME_MAC or LASTNAME_WINDOWS, depending on whether you want to present from a Windows or a Mac computer. A0 format (118.9 cm × 84.1 cm; portrait orientation). You will be given a poster number, which will be displayed at the top of your poster board. There will be two poster sessions on day 1 and 2 (each lasting 2 h), with half of the posters being presented on each day. However, all posters can be left hanging for the duration of the meeting and we encourage you to do so for increased visibility. How about public transport and other accommodation options? There also are many hotels/hostels/apartments along the train line between Lisbon and Cascais (train line named Linha de Cascais → schedule). Oeiras and the IGC are halfway between Cascais and Lisbon. The Oeiras train station is a 5-min walk from IGC, with trains travelling to Lisbon (Cais do Sodré) or Cascais every 20-min (maximum). Travelling from Lisbon to Oeiras costs 1.90 € and takes 17-24 min, whereas travelling from Cascais to Oeiras costs 1.60 € and takes 16 min. If you prefer to stay in Lisbon, close to Cais do Sodré or along the green Metro line, as close as possible to Cais do Sodré, you'll be in the centre of Lisbon and at a easy-to-commute distance to IGC. 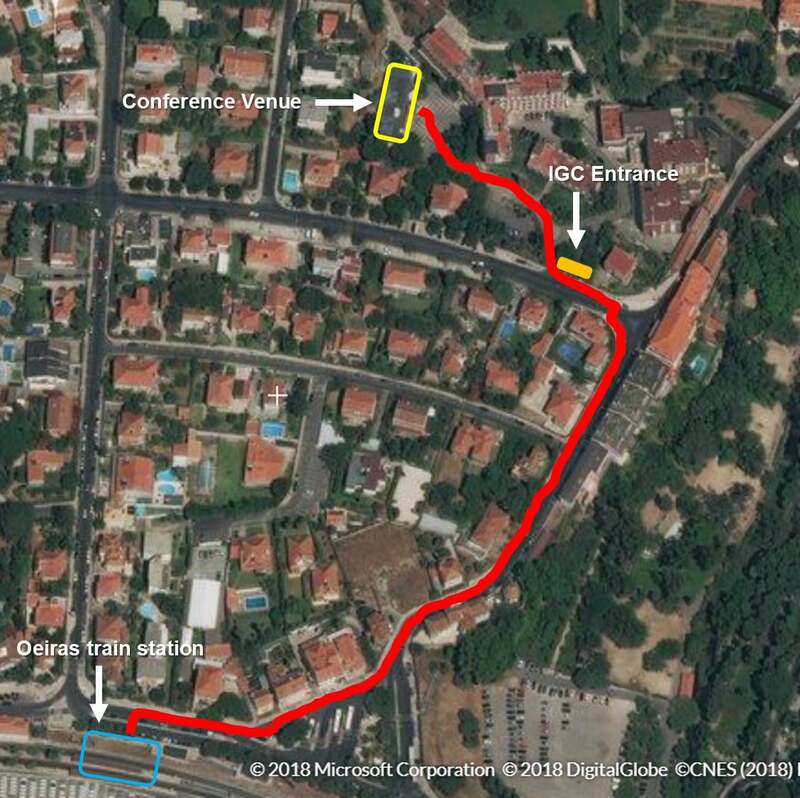 If you prefer to stay away from the city and closer to the beach, options would be Carcavelos, Parede, Estoril, Cascais, again, as close to the respective train stations as possible. To travel by train/Metro, the easiest and cheapest is to get a Lisboa Viva card (0.50 €) and charge as you go along (Zapping mode). You can charge Zapping with a minimum of 3 € and a maximum of 40 €. It can be used in all public transport in Lisbon (including buses and trams) and it's cheaper option per journey. Yes, we will offer a limited number of travel grants for young researchers (PhD students and post-docs) that have submitted an abstract to the symposium. Each grant will be worth €500 and recipients will be selected directly from the submitted abstracts. As the number of grants will be limited, priority will be given to researchers from lower-income countries and researchers traveling from further away. How about prizes for best talk or poster? We will award prizes for best oral presentation and for the best poster. The best oral communication award (400€) is kindly sponsored by Câmara Municipal de Oeiras and the poster prize (200€) is kindly sponsored by FEBS letters. Do you have a bird's view representation of how to get to the venue from the train station? Follow the red path on this satelite image map showing the way from the train station to the venue. Copyright © 2018 Evil Dynamics, All Rights Reserved.